However for a variety of reasons — cost, lack of expertise, size of funds — most investors are not implementing a laddered strategy. In the last year, two different product suites have launched in the ETF space allowing investors to access laddered income investments in the Municipal and Corporate bond areas. These suites of products are low cost, professionally selected and are accessible to smaller portfolios. They are hidden gems in an ocean of poor alternatives and in many cases will give income investors what they want and what they need. iShares started the laddered fixed income suite of ETFs trend with their Muni Series. They currently offer six different national AMT free ETFs with planned end dates from 2012 thru 2017. Following closely was Claymore Securities, with their Bulletshares lineup. Currently Claymore offers seven different investment grade corporate bond ETFs with planned end dates from 2011 thru 2017. As both their literature outlines, these ETFs bring a number of important benefits to investors in a single product solution including: monthly income distributions, planned end dates, diversification, transparency of holdings and cost, and exchange traded liquidity. The outcome of all of this is the ability for investors to implement a low cost, custom tailored laddered fixed income strategy that balances risk and reward. 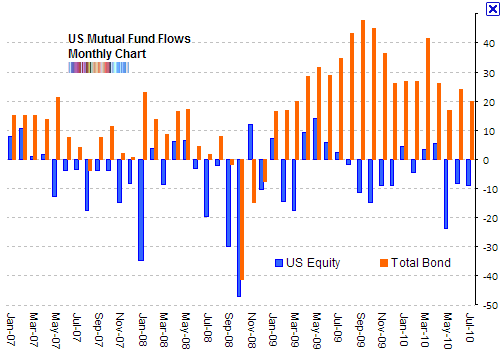 In the meantime here is a graphic based off ICI on 2010 mutual fund flows as of June.